I’ve had a few stories in the Foreign Correspondent’s Club of Japan magazine before now, but this is the first time on the cover. A project close to my heart too. 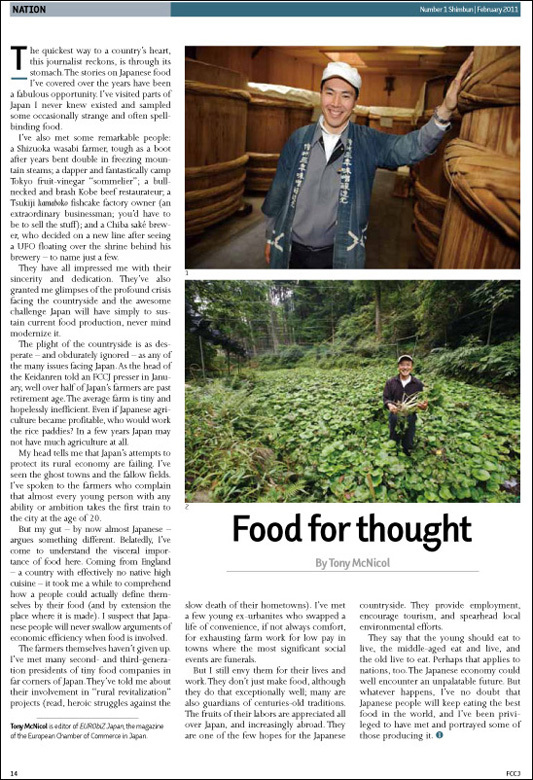 As I wrote in the text (see below) to go with these portraits, I have enormous respect for the people producing Japan’s fantastic food and drink. They live their work in a way that we Tokyo strap-hangers find hard to truly understand. And they face a very uncertain future. 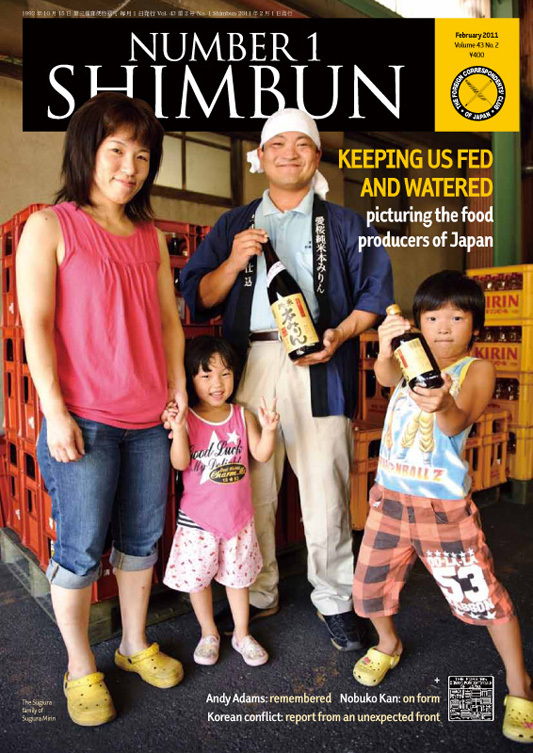 I wonder what Sugiura-san will think about his family being on the cover of this magazine? I’m going to send him a copy. The quickest way to a country’s heart, this journalist reckons, is through its stomach. The stories on Japanese food I’ve covered over the years have been a fabulous opportunity. I’ve visited parts of Japan I never knew existed and sampled some occasionally strange, often spellbinding, food. 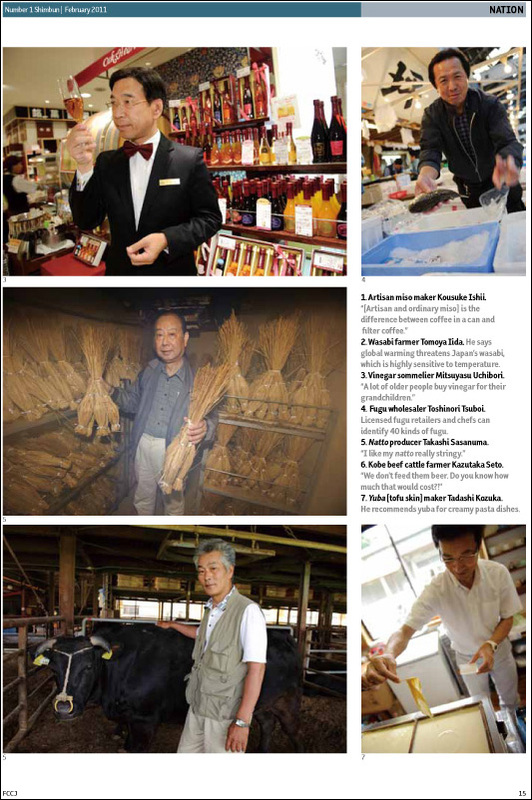 I’ve met some remarkable people: a Shizuoka wasabi farmer (tough as a boot after years bent double in freezing mountain steams); a Tokyo fruit-vinegar ‘sommelier’ (dapper and fantastically camp); a Kobe-beef restaurateur (bull-necked and brash); a Tsukiji kamaboko fishcake factory owner (an extraordinary businessman; you’d have to be to think of selling the stuff); a Chiba sake brewer (who decided on a new sake range after seeing a UFO floating over the shrine behind his brewery) – to name just a few. They all impressed me with their sincerity and dedication. The also granted me glimpses of the profound crisis facing the countryside and the awesome challenge Japan will have simply to sustain current food production, never mind modernize it. The plight of the countryside is as desperate – and obdurately ignored – as any of the many facing Japan. As the head of the Keidanren told an FCCJ presser in January, well over half of Japan’s farmers are past retirement age. The average farm is tiny and hopelessly inefficient. Even if Japanese agriculture became profitable who would work the rice paddies? In a few years Japan may not have much agriculture at all. My head tells me that Japan’s attempts to protect its rural economy are failing. I’ve seen the ghost towns and the fallow fields. I’ve spoken to the farmers who complain that almost every young person with any ability or ambition takes the first train to the city at the age of 20. But my – by now almost Japanese – gut argues something different. Belatedly, I’ve come to understand the visceral importance of food here. Coming from England – a country with effectively no native high cuisine – it took me a while to comprehend how a people could actually define themselves by their food (and by extension the place where is made). I suspect that Japanese people will never swallow arguments of economic efficiency when food is involved. The farmers themselves haven’t given up. I’ve met many second, third generation presidents of tiny food companies in far corners of Japan. They have told me about their involvement in “rural revitalization” projects (read, heroic struggles against the slow death of their hometowns). I’ve met few young ex-urbanites who swapped a life of convenience, if not always comfort, for exhausting farm-work for low pay in towns where the most significant social events are funerals. But I still envy them for their lives and work. They don’t just make food, although they do that exceptionally well, many are the guardians of centuries old traditions. The fruit of their labours is appreciated all over Japan, and increasingly abroad. They are one of the few hopes for the Japanese countryside; they provide employment and encourage tourism; increasingly many spearhead local environmental efforts. An aged Japan economy could well encounter an unpalatable future. But whatever happens, I’ve no doubt that Japanese people will keep eating the best food in the world. I’m privileged to have met and photographed some of the people producing it. They say that the young should eat to live, the middle-aged eat and live, and the old live to eat. Perhaps that applies to nations too? Tony McNicol is editor of EURObiZ Japan, the magazine of the European Chamber of Commerce in Japan. This entry was posted on Saturday, February 26th, 2011 at 10:29 pm. It is filed under manga, mobile-phone photos, my articles, my photos, Tokyo and tagged with drink, farms, food, food producers, photos. You can follow any responses to this entry through the RSS 2.0 feed. It actually took an accident and a broken jaw for me to understand the importance of food so this article really talks to me. It makes me want to go and meet all those great people!